The new trailer for Wreck-It Ralph 2 is here and it puts more focus on Sarah Silverman's Vanellope von Schweetz this time around. John C. Reilly's titular character is shown off quite a bit along with some new characters, but Vanellope steals the show when she meets up with all of the Disney Princesses, who seem to be more than a little bitter. This is the same footage that fans were shown at the D23 Expo last summer and proved to be pretty popular, especially when all of the surviving voices of the Disney Princesses appeared on stage together. In the new trailer for Ralph Breaks the Internet, Vanellope along with her best friend Ralph, venture into the world of the internet through an ethernet cable in the Litwak's Video Arcade. 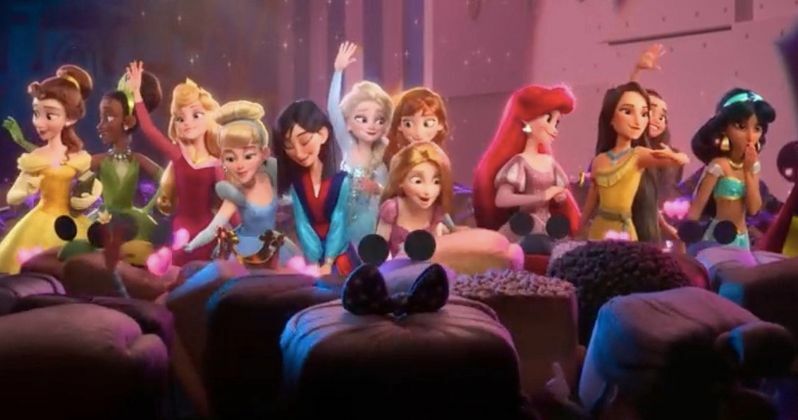 There's many good scenes in the new footage, but the best has to be when Vanellope finds herself surrounded by Disney princesses and is surprised to learn that she actually has a lot in common with them. Cinderella breaking her glass slipper to cut Vanellope is both hilarious and a little disturbing. The scene features several of the original princess voices, including Auli'i Cravalho (Moana), Kristen Bell (Anna in Frozen), Idina Menzel (Elsa in Frozen), Kelly MacDonald (Merida in Brave), Mandy Moore (Rapunzel in Tangled), Anika Noni Rose (Tiana in The Princess and the Frog), Ming-Na Wen (Mulan), Irene Bedard (Pocahontas), Linda Larkin (Jasmine in Aladdin), Paige O'Hara (Belle in Beauty and the Beast), and Jodi Benson (Ariel in The Little Mermaid). Ralph Breaks the Internet: Wreck-It Ralph 2 leaves Litwak's Video Arcade behind, and ventures into the uncharted, expansive and awe inspiring world of the internet. Ralph and fellow misfit Vanellope set out on a new journey by traveling to the world wide web in search of a replacement part to save Vanellope's video game, Sugar Rush. When the going gets tough, they have to rely on the citizens of the internet, aka the netizens, to help navigate their way, including a website entrepreneur named Yesss (voiced by Taraji P. Henson), who is the head algorithm and the heart and soul of trend-making site BuzzzTube. When the first Wreck-It Ralph opened in November of 2012, it turned in the highest opening weekend ever for a Walt Disney Animation Studios film at the time of release. Now, the pressure is on for Wreck-It Ralph 2 to duplicate or even best the debut of the first film. With all that the internet has to offer, it looks like the sequel is well on its way to box office success. Star Wars is represented with Stormtroopers and X-Wing fighters, while the rest of the web is shown off featuring, Twitter, Snapchat, Amazon, and of course everything Disney, to name a few. Wreck-It Ralph 2 officially hits theaters on November 21st, 6 years after the debut of the original. Outside of the comfortable Litwak's Video Arcade, Ralph and Vanellope have the potential to wreck a lot more stuff, so it looks like everybody is going to be in for an entertaining ride when the movie hits theaters. You can check out the new trailer for Wreck-It Ralph 2 below, thanks to the Walt Disney Animation Studios YouTube channel.